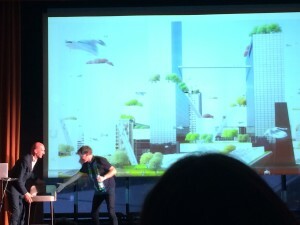 May 30th., the Rotterdam Month of Architecture was officially opened with a dense, disruptive, speed-up and above all humorous lecture by Winy Maas from MVRDV Architects. (a.o. Markthal, Boijmans Depot) , pleading for a increased use of the city’s roofs and thus also facilitating a new experience. Although adding staircases to major buildings after the current one to the Groothandelsgebouw will probably remain rather utopian (? ); the fundamental thought of adding a layer to the cities and create lived space above street level and thus expand our views is fascinating. Dit bericht werd geplaatst in blog en getagged architecture; smart city. door martinpot . Bookmark de permalink .